We have been spending time learning about how to choose books that will help us become better readers. 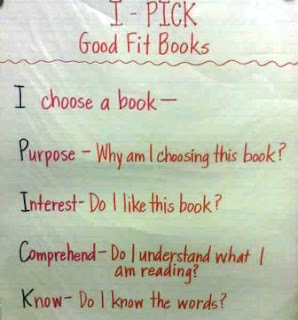 The students are aware that choosing a book that is too easy or too hard will not help them improve their reading skills. One of the important lessons from Daily 5 we recently worked on included making an anchor chart to remind us of these important facts before choosing books to add to our personal "book baggies" used during the Read to Self block. This is the chart below. You can help with these ideas at home also. The widget below is from Scholastic and allows anyone to look up a book and check the levels for it--both Lexile and Guided Reading. We use both at Harding. Your student should know his or her levels and is learning to use these as a guide to "good fit" books.